It’s great when life confirms for you now and then that you are, indeed, hanging out with the right people: folks with similar outlooks on life, priorities in line with your own. I’ve had some recent examples of that this past week based on conversations about the weather. In someone else’s circle, that might mean talk of relishing longer, warmer afternoons for a game of golf, or perhaps chatter turns to wardrobe and fun new seasonally-appropriate togs. So, ’tis the season to begin thinking rosé. And the rosé in my house right now is from Chinook Wines in Prosser, owned by friends Kay Simon and Clay Mackey. While I was working on Salty Snacks , Kay mentioned that among the trees on their property were some particularly productive walnut trees. As an aside, she lamented that so many commercially roasted nut mixes and recipes have a good dose of sugar. She was hoping to come up with a recipe more toward the savory that would pair well with their wines, especially the rosé. 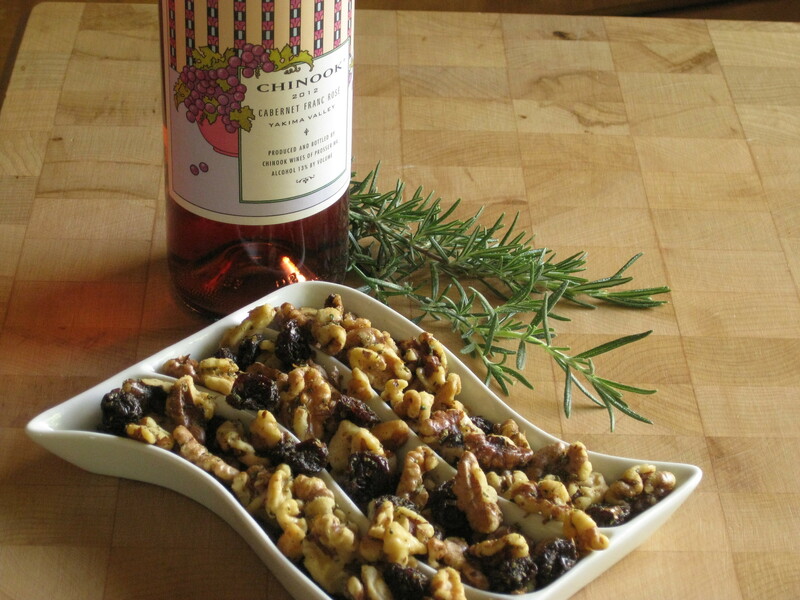 That seemed like an easy enough problem to solve, so I took inspiration from her walnuts, dried tart cherries from Chukar Cherries also based in Prosser, and a healthy dose of aromatic rosemary. Just the thing to toss together to enjoy with some of your first sips of rosé this season! Put the walnuts in a medium bowl and drizzle the butter over, tossing well to evenly coat the nuts. Add the rosemary, salt and pepper and toss well to evenly mix. Spread the nuts out on a rimmed baking sheet. Bake until the nuts smell toasty and are just lightly browned, 12 to 14 minutes, stirring a few times to ensure even cooking. Transfer the nuts to a bowl (it can be the same bowl they were first mixed in), add the dried cherries and toss to mix. Let cool, then transfer to a serving bowl or store in an airtight container for up to 5 days. Sounds wonderful, Cynthia! A must try.